Does the thought of a huge ‘meringue’ dress pastel-clad bridesmaids, a vintage car and enormous, icing-covered cake fill you with horror? Chances are you’re not the traditional type when it comes to weddings. Happily, in this age of designer style at knock-down prices, there’s every reason to take a cutting-edge approach to your plans and ensure you’re the most up-to-the-minute bride walking down the aisle this year. Churches are too traditional, beaches too clichéd, and stately homes just too stuffy…so where’s the modern bride to marry? If you want surroundings packed with style, consider a public exhibit. Museums, art galleries and places of interest of all kinds hold wedding licenses, and many have a dedicated planner to help you make the most of what’s on offer. For history fiends, a torchlit reception around the stunning central pool of Bath’s Roman baths is hard to beat, while gadget obsessives will love partying next to the Apollo 10 command module at the London Science Museum. Or, if you’re an animal lover, why not go on a safari among tigers, lions and elephants at Chester Zoo? For those wanting to maintain the tradition of wearing white, but without the frills and frippery, go for an A-line or sheath dress that’ll form a blank canvas for whatever accents you wish to add. Strong, deep colours complement white and cream beautifully and make a bold visual statement that’s far more arresting than pastel tones – try sashes or flowers in deep red, fuchsia pink or purple. The bills for today’s wedding dresses can easily reach four figures – so rather than opt for a catalogue dress as worn by dozens of other brides, why not browse the rails of fashion designers for a fantastic evening gown in whatever colour you fancy? It’s certain to be much more wearable than a heavy formal dress and, unlike a wedding gown, will see you through years of parties to come. As with the dress, a two-colour scheme in white, gold, silver or deep jewel colours is a brilliant way of achieving a strong, contemporary look without seeming too clinical or minimalist. Pick sculpted, slender flowers in dark red, purple or even black – arrangements of roses, lilies, gladioli or tulips wrapped in a simple ribbon (no bows, obviously) fit the bill perfectly, both for bouquets and in displays. When it comes to the reception, white china against dark tablecloths looks effortlessly elegant. Leave off the fussy centrepieces and try adorning tables with coloured wine and water glasses, which are practical as well as decorative in their own right. Stodgy fruit cake and thick royal icing smack of genteel old ladies rather than young, stylish brides. Start by ditching the conventional recipe in favour of a more exciting filling – try wicked chocolate mousse cakes or feather-light sponges flavoured with anything from vanilla to coffee. For a real departure from the norm, go for a tower of cupcakes or even a classic French-style ‘croquembouche’ – a tall cone-shaped confection of profiteroles, nougat and caramel. Yum! Decoration should be fun, frivolous and as far from the classic frills as you can go. Cake makers have an army of weapons at their disposal including coloured icing, edible glitter, lustre powder and even gold leaf, so your cake can fit in with the colour scheme or be an outrageous rainbow-hued delight. Finally, make sure your guests have a lasting reminder of their ultra-modern experience by offering up quirky favours for them to take home. 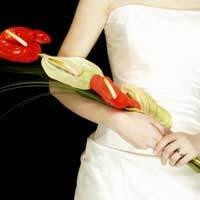 If you’ve got an unusual venue, talk to the wedding planner about purchasing gifts from their shop as mementoes. After all, who’s going to want a slice of wedding cake when they can have a handful of moon rock and dehydrated astronaut ice-cream? !